Mark-Viverito cut the ribbon at the beginning of the parade without him or Mayor de Blasio, but she caught up to Lopez Rivera as his float reached Central Park. 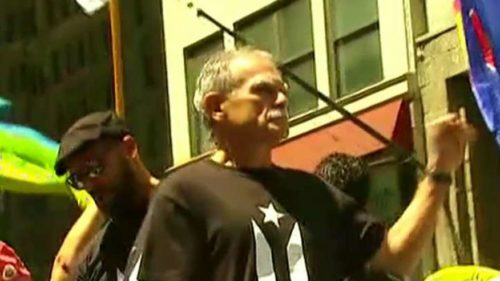 De Blasio, who previously said he would not march if Lopez Rivera was honored, nonetheless marched but kept a roughly 10-block buffer between himself and the divisive Lopez Rivera. More than half a million people voted for statehood during Sunday’s referendum, followed by nearly 7,800 votes for free association/independence and more than 6,800 votes for the current territorial status. Voter turnout was just 23 percent. UPDATE: As Jazz put it, Puerto Rican Day Parade Turns Out Pretty Much As Embarrassing As You’d Imagined, with DeBlasio hiding ten blocks away. This idiot will now be running around PR spouting tired old communist crap and trying to stir up trouble. First he will have to make a pilgrimage to Castro’s grave, of course. The world has changed my friend. Be sure to make a stop in Venezuela and see how the revolution is really going. Maybe take your Harvard Marxist buddy Obama with you so you can both see how the proletariat is surviving in socialist paradise.